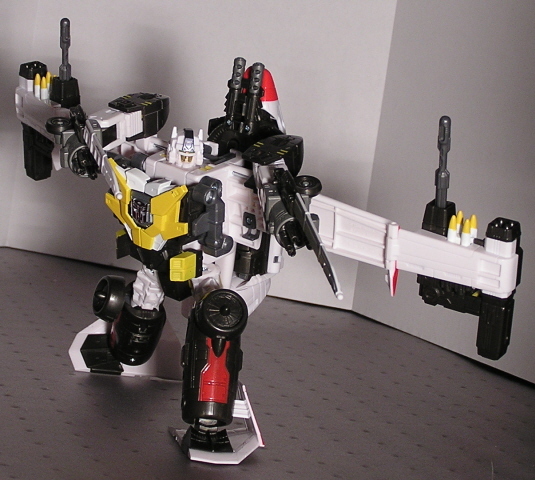 Wing Saber was one of the figures that the US market never got to experience in the G1 realm. 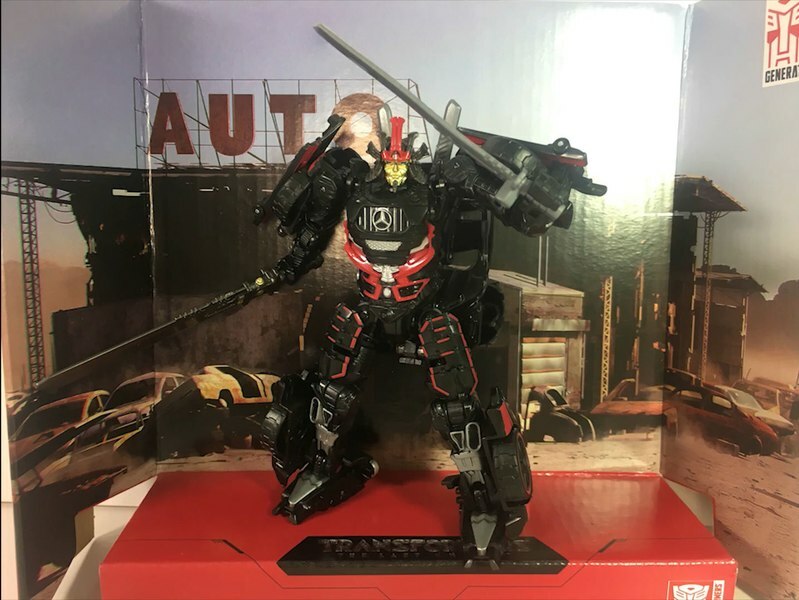 However, it was one of the best figures that was put out after Hasbro pulled out of the market. 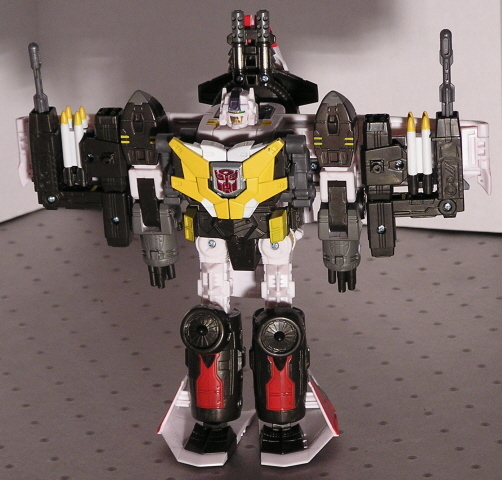 Wing Saber appeared again in Energon. While capturing the look of the G1 Victory! figure, it's bulkiness somewhat detracted from the total feel. 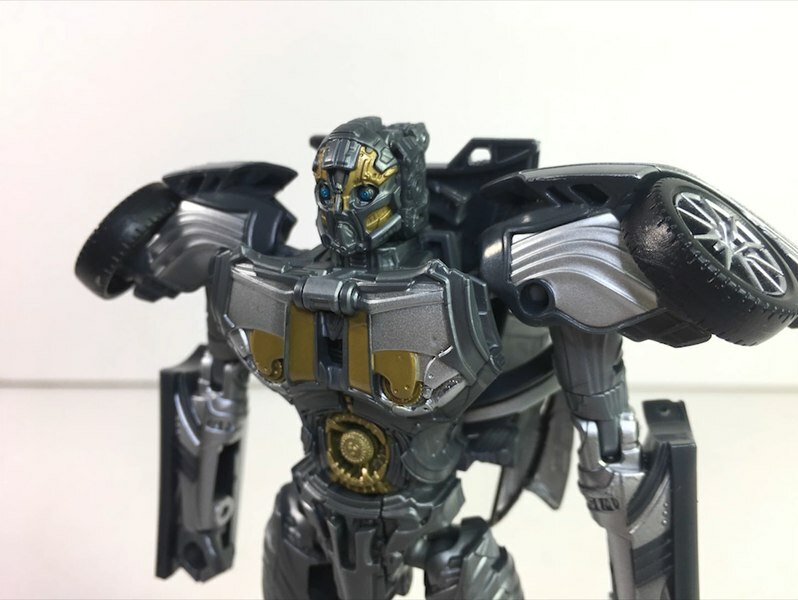 For Cybertron, HasTek has scrapped most homage and went with an entirely new direction. 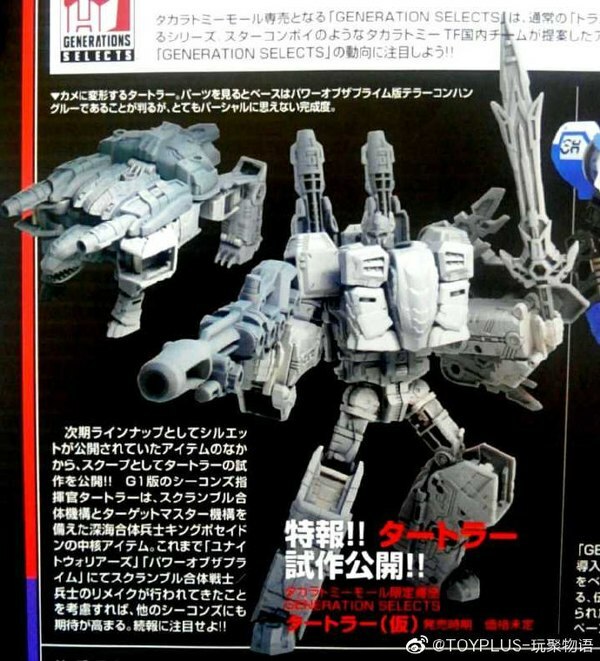 Wing Saber now appears to be a Cybertronian style jet. The craft is mostly white with some red and bronze accents. There are several subtle yet interesting details to this figure. Most noticeably is the armament. There are 4 missiles, a 4 warhead battery, one useable launcher and a vulcan cannon on each wing. This is in addition to the twin laser cannon on the nosecone. Right away, you know this mode is built for battle. There are also 2 hefty turbines to power this craft, one on each tailwing. Unfortunately, due to the design the tail section has a tendency to pop loose from the not-so-well designed tabs. It's easy to fix, but it makes the figure seem delicate. Also note the flame deco on each turbine, a nice touch. The Autobot decals on the fuselage are also a unique yet nice touch. One other note about the fuselage. 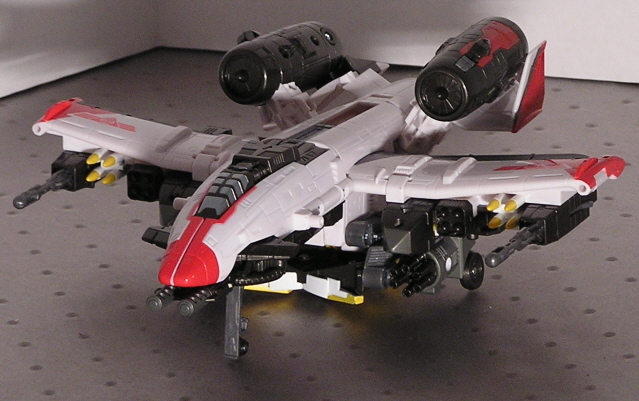 The bottom section can flip over 180 degrees, but really isn't meant to in Alt mode. Due to another weak tab design, it does have a tendency to flip out and even come loose from the hinge. Another easy fix, but this shows poor planning. The nose wheel does fold up into the body, but the 2 wheels on the fuselage do not. Therefore, it seems somewhat out of place when "airborne". Finally, on the back of the fuselage are moveable rudders. While this seems to make the craft more accurate in detail, these rudders serve a much different purpose later. Inserting the Cyber Key behind the cockpit splits the nose in 2 and reveals more of the twin cannons, plus a ported cannon above that. 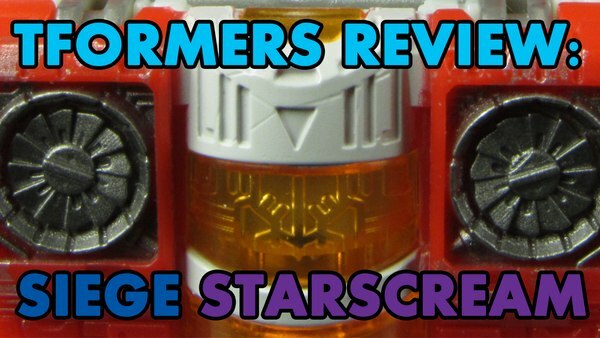 The split nosecone now becomes a ram-scoop for use with his warp capabilities. This is a very different approach to the Key function and one that does this mode pretty well. Transformation is somewhat involved with the legs, but is otherwise pretty comprehensible. His robot mode is a mixed bag. Overall, he's very sharp looking. The tailwings become his feet. These feet are somewhat curved so you can imagine the poseability issues with that type of design. The arms are also a bit weird in how the shoulders operate. Seems out of place when doing certain poses. The color scheme remains mostly the same except for the yellow chestplate. Wing Saber has good detail to his face, but no light piping. The rudders I mention earlier form his Katana blades. The blade handles reside in the bottom of his tail section. Snap the rudders off, place them in the holders and his Katanas are now ready. Since Wing Saber has no hands, there is a peg to press the swords into. It doesn't look quite right, but due to the vulcan cannon becoming his "hands", there's really not much that can be done. Also note the extended wings. This is considered to be his Combat Mode. 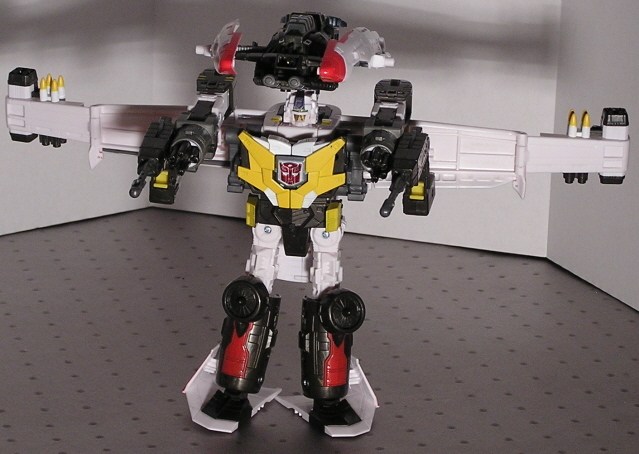 The Cyber Key function works the same, except you can lift the nosecone up and over his head making it very useable. Also, you can use the launchable missiles in the same pegs as the Katanas if you rather him have long range battle capability. 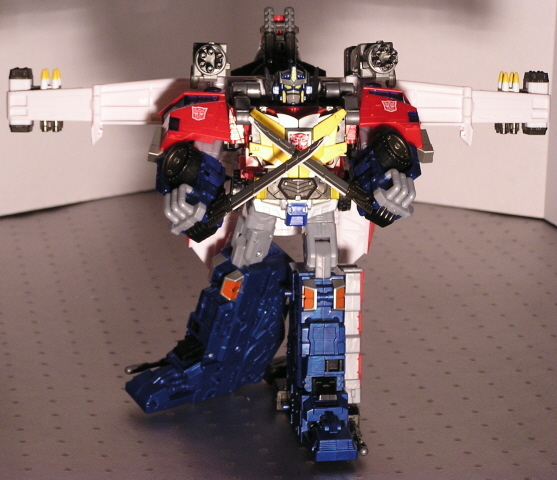 One final trick that Wing Saber has is the ability to combine with Optimus Prime to form Sonic Wing. 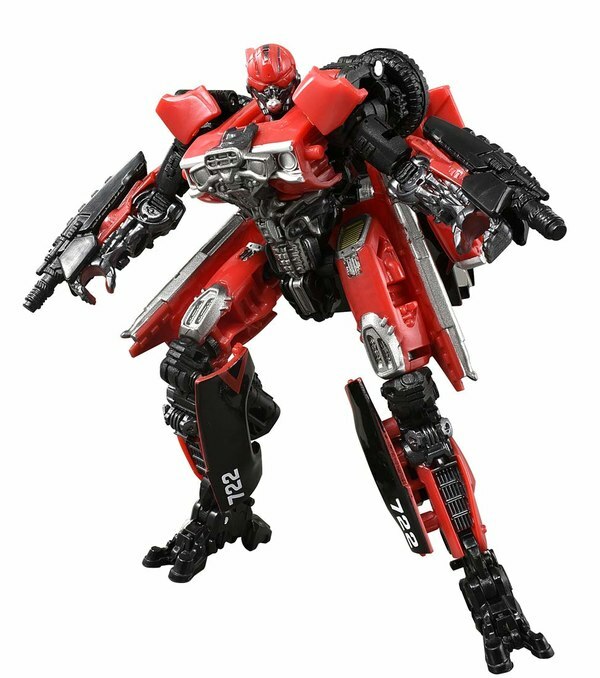 To form Sonic Wing, transform Optimus into his Super mode sans container. Wing Saber's launchable missiles bolt onto the back of his feet. Once Wing Saber is transformed correctly, which isn't too hard, the chestplate wraps around Prime and snaps into place. The result is the single best reason to buy this figure. Prime looks absolutely sharp with the shoulder mounted vulcan cannons. You can also do some decent poses with the Katanas. Prime's hands have a peg hole built into them where the Katanas press firmly into place. 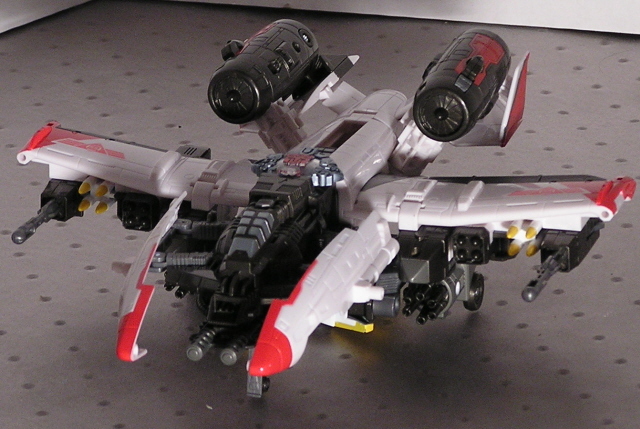 Finally, as with Wing Saber's robot mode, you can use the Cyber Key in Sonic Wing mode in the same fashion. While the Wing Saber figure on it's own has some slight shortcomings, combining him with Prime to form Sonic Wing makes up in spades.